The staff and volunteers at Hawks Aloft come from a wide variety of backgrounds. Each member of the Hawks Aloft team brings valuable knowledge, insight, and vision to the organization. My background for this position is non-traditional. As an artist and writer, I have written three books in another field and published numerous articles, including peer-reviewed manuscripts. Back in 1988, I met and fell in love with an educational Red-tailed Hawk. 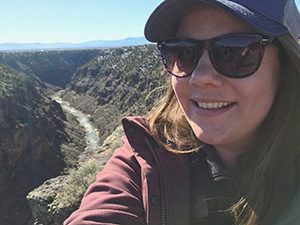 I began working as a volunteer for a local conservation organization, and it wasn’t long before I became a staff member writing training manuals, grants, editing their newsletter, etc. However, it was education that was my first love, followed by field research. Today, I thoroughly enjoy all aspects of Hawks Aloft, from working in the field studying nesting raptors along the Rio Grande bosque and songbird surveys to education programs to working with our large cadre of non-releasable education birds. I have been thrilled to write not only technical papers but also articles about birds and nature for the general public. In my other life, I am a professional quilt maker (Gail Garber Designs) and often travel to teach and lecture methods that I have developed in this media. My leisure time is often spent outdoors, searching for birds and more birds, but my dogs and I also enjoy the peace and quiet of our mountain home (and the birds). Click here to contact Gail. I grew up in northeastern Oregon and received a B.A. in English from Whitman College. Upon realizing that my baseball career was not going to advance beyond college, and that I didn’t want to teach English, I decided to pursue my interest in nature. I received an M.S. in Environmental Studies from Southern Oregon University, and it was during that time I discovered my obsession with birds. After completing my M.S., I spent several years working for the Oregon Cooperative Wildlife Research Unit studying Spotted Owls in southwestern Oregon and two years as the project coordinator of a MAPS station for the Medford, Oregon, district of the Bureau of Land Management. 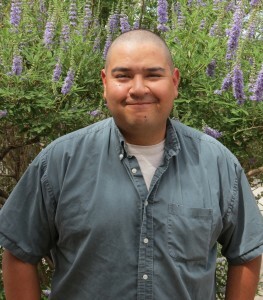 I completed my Ph.D. in Ecology and Evolutionary Biology at New Mexico State University in 2010. Click here to contact Trevor. Hello everyone, my name is Ellie Althoff. I grew up in the western suburbs of Chicago where an abundance of forest preserves sparked my interest in the environment. I graduated with a B.S. in Environmental Sustainability and a B.A. in Communication from the University of Illinois at Urbana-Champaign in 2016. From there, I jumped to the East Coast as the Volunteer Coordinator at a wildlife rehabilitation center. During that time I learned how to feed, medicate, and release approximately 100 different species including ten species of raptors. In August of 2017, I transitioned into a position at an environmental education center as the Outreach Educator. I had the pleasure of leading third through fifth graders on field trips to local natural areas where they spent two hours learning environmental concepts through play, conducting stewardship, and exploring nearby habitats. I am now combining my passion for raptors and education as the Education and Outreach Coordinator at Hawks Aloft. Other interests of mine include hiking, kayaking, and rock climbing. I hope to pursue a graduate degree in nonprofit management, but am currently content gaining experience in the field and reading at home next to my rescue dog, Felix. Click here to contact Ellie. I grew up in central New Mexico and spent the majority of my childhood outside catching toads, snakes, and lizards. Upon graduation from high school I decided to pursue my love of nature in a formal setting. I graduated from Western New Mexico University in 2003 with a B.S. in Forestry/Wildlife. My summers were spent working for the US Fish and Wildlife Service throughout the southwestern US. I enrolled in graduate school at New Mexico State University and I eventually transferred to Texas A&M University to immerse myself in an active herpetology program. I radio-tracked Dunes Sagebrush Lizards (Sceloporus arenicolus) in southeastern New Mexico and operated trapping grids for a Dunes Sagebrush Lizard mark-recapture study in Chaves County, NM. I have remained active in Dunes Sagebrush Lizard conservation, management, and research since 2004. If I’m not in southeastern New Mexico performing lizard surveys, I’m at home with my wife and daughter or assisting Hawks Aloft with GIS needs. 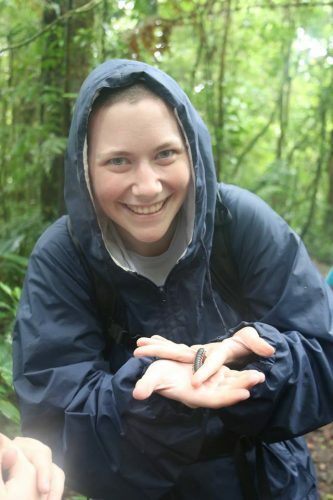 While I could be classified as a herpetologist, I prefer to think of myself as a naturalist with more knowledge about amphibians and reptiles than other groups of organisms. I have a deep respect for our natural world and I never want to lose my connection to it. Click here to contact Mike. I was born in Indiana and bounced around the Midwest, Southwest, and East Coast before landing in Albuquerque, a place which I am very proud to call home. I graduated with honors from Indiana University in Bloomington, Indiana, with a degree in English with an emphasis in creative writing and have had the pleasure of applying my talents to many literary pursuits. I’ve nearly completed a certification in technical writing, curate a monthly book club, contribute to an online journal of nature and travel writing and work as the arts and lit editor for the Weekly Alibi. I have had the pleasure of working in education at the elementary, high school, and college level in both the United States and during a great adventure in the far east. In addition to my love of the written word, I also find immense joy in nature and working with wild animals. 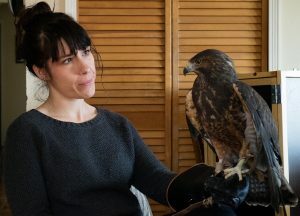 After a stint in wildlife rehabilitation off the coast of Washington, I sought to meld my two passions and have found a perfect fit in my position at Hawks Aloft. When I’m not working and writing I enjoy nightly runs along the Bosque, watercolor painting, and, of course, reading. Click here to contact Maggie. parents’ house catching lizards and snakes. After high school I attended the University of New Mexico and received a BS in Biology. While receiving my undergraduate degree I took an ornithology course and realized my love of birds. Eventually, I would like to pursue a graduate degree that focuses on research within the ornithological field. I worked seasonally from 2012 to 2015 as a Wildlife Technician for the US Forest Service. 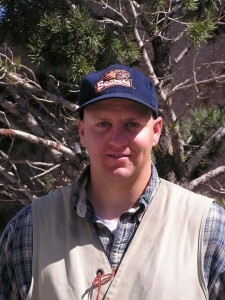 I have worked in forests in New Mexico, California and Arizona. The majority of my field experience has been conducting surveys for Spotted Owls and Northern Goshawks. My work with Hawks Aloft consists of Mexican Spotted Owl surveys, song bird surveys and raptor nest surveys, as well as delivering educational programs. My free time is spent outdoors camping and hiking with my dog Dexter. I also love to crochet and knit. Click here to contact Amanda. Originally from Canada, I spent the majority of my formative years as an expat in Saudi Arabia. While on vacations in the US, I was fortunate enough to do a great deal of camping in the Southwest with my family; this is where I discovered a love for wildlife and the outdoors. During my undergrad years in northern Arizona, I participated in Northern Goshawk and Spotted Owl research as I earned a BS in parks and recreation management, as well as minors in biology and forestry. Fate intervened shortly after graduation, and I started working as an accountant. I went on to earn my MBA, and I have also owned two dog grooming businesses. In my free time, I love to camp, travel, and craft, and of course, spend time with my family and two dogs. Click here to contact Angela. I grew up Oklahoma loving nature, being outside, and, of course, catching frogs. I attended the University of Central Oklahoma where I fell in love with birds and spent many hours catching and banding marshbirds for the majority of my undergrad. I graduated in 2014 with a BS in Biology. 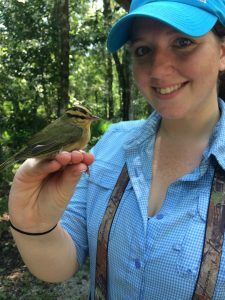 I then went on to receive my MS in Biology from the University of Louisiana at Lafayette in 2017, looking at the distributions of waterbirds and their habitats in coastal Louisiana. My passion for birds has taken me several places in the last few years. After graduating with my MS, I spent a summer at the Great Smoky Mountains Institute at Tremont teaching children about birds and nature. Following that, I spent 7 weeks in central Panama at the Canopy Tower conducting an annual raptor count for Panama Audubon. 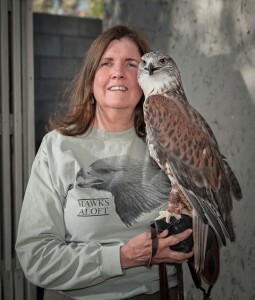 My work at Hawks Aloft consists of songbird and raptors surveys, as well as coordinating volunteers for raptor rescues. When I’m not out birding or exploring, I enjoy reading and hanging out with my cat, Diesel, and my ball python, Cecil (but not together!). Click here to contact Katrina. Arlette comes to Hawks Aloft after spending years volunteering on research projects examining local Cooper’s Hawks populations and, later, on field surveys for Hawks Aloft. 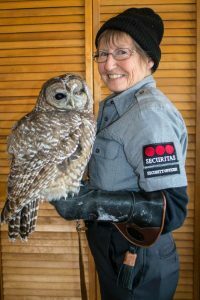 A former journalist and customs broker, Arlette brings lots of thoughtfulness and attention to her interactions with callers to our 24/7 Raptor Rescue Hotline (which she staffs), as well as with the volunteers and rehabilitators she works with. 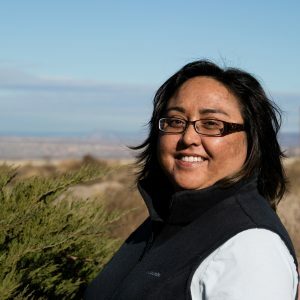 When she’s not coordinating rescues, Arlette enjoys making jewelry, spending time with her family, and hiking and camping throughout the Southwest.